Here, you will find a tiny snapshot of some of the work we've completed, with some projects completed. 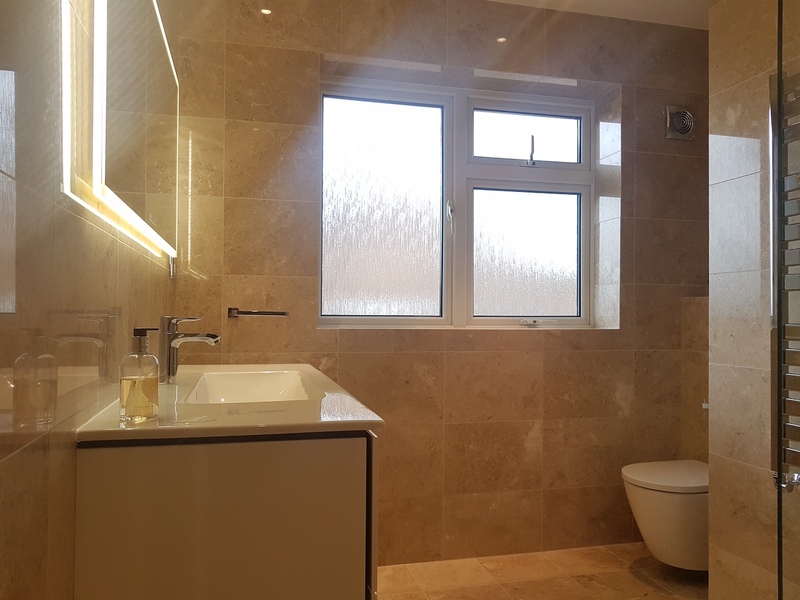 We work with all builders to ensure the smooth running and completion of your project. 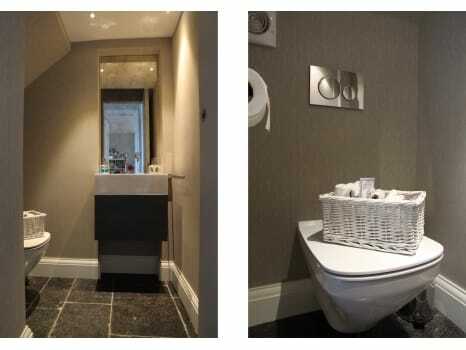 Whether you wish for design, design and supply or supply only, we cater to all your requirements. Below are only a small selection of the projects we have completed. 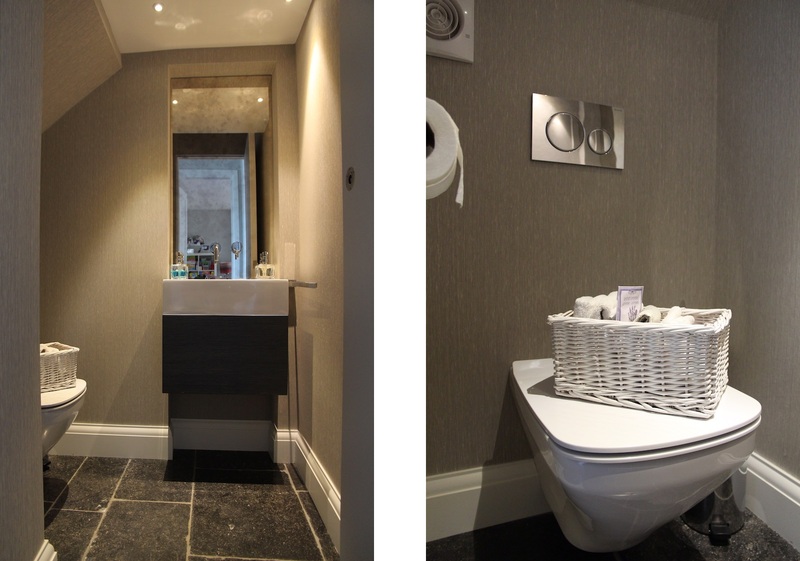 Please see our Houzz or Pinterest pages for more pictures of our recently completed bathroom projects. 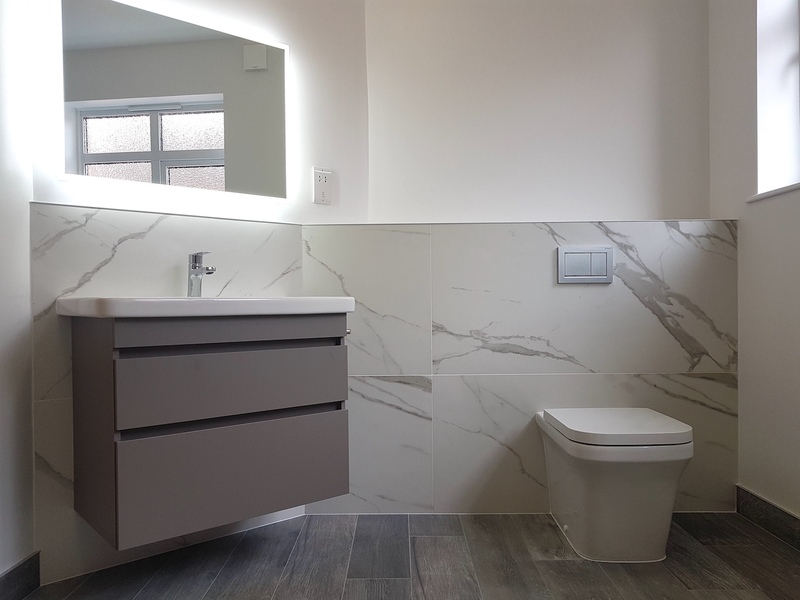 This bathroom featured a custom handless vanity unit in a White Matte Lacquered finish (any RAL colour available from us) with a custom quartz Silestone worktop and upstand. 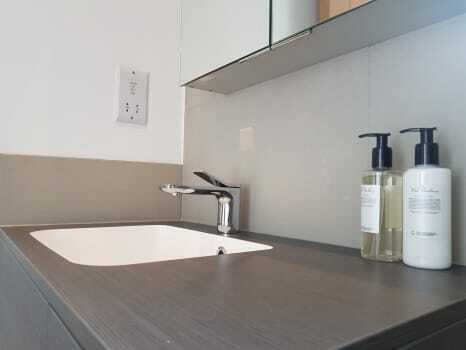 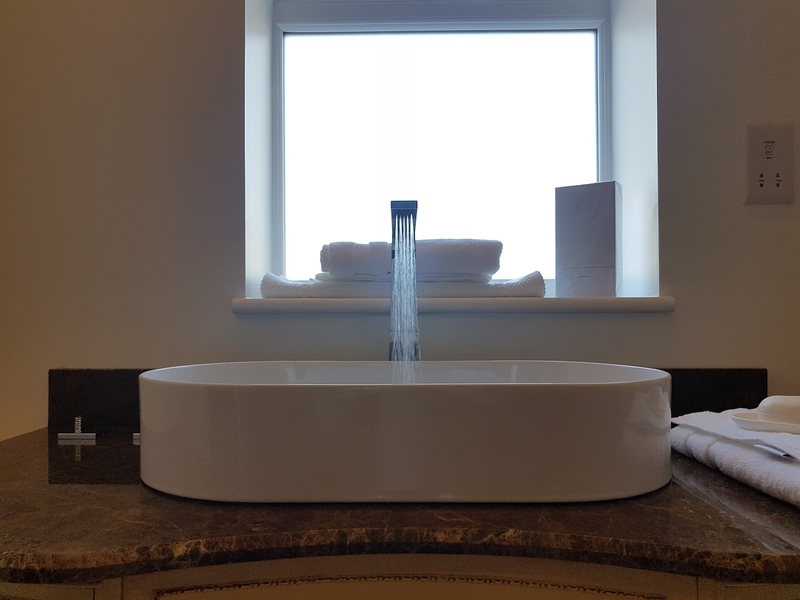 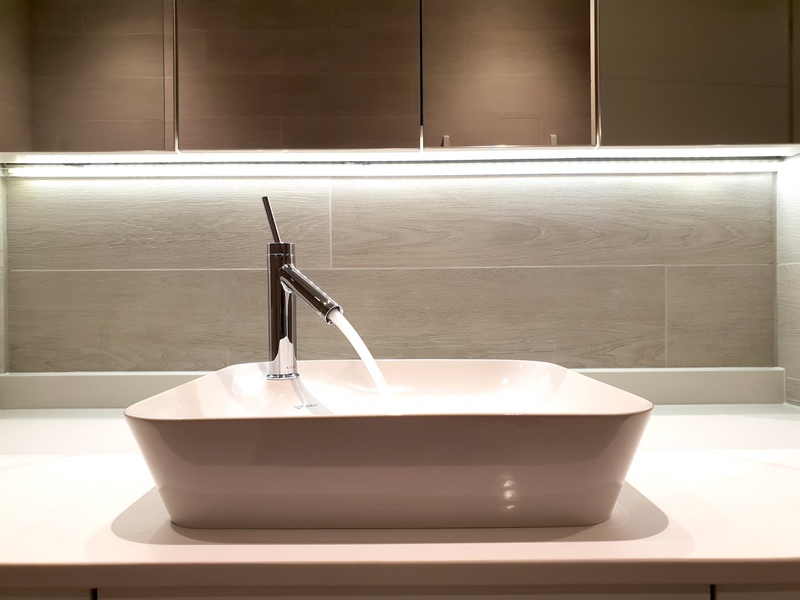 To complete, we had a Duravit countertop washbasin fitted with the sleek and beautiful Axor Stark single lever basin mixer finishing things off. An absolutely beautiful bathroom. A contemporary bathroom that was 3D designed, supplied and fitted by bathroomOne. Large format 1.2m wide tiles were used for the floors and walls, alongside a bespoke custom steam shower enclosure fitted to a sloped ceiling. 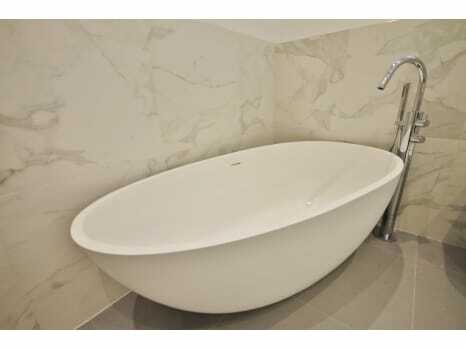 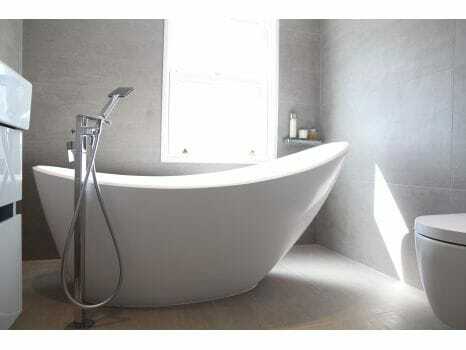 A beautiful Ashton and Bentley freestanding bathtub is, however, the centrepiece of this bathroom. 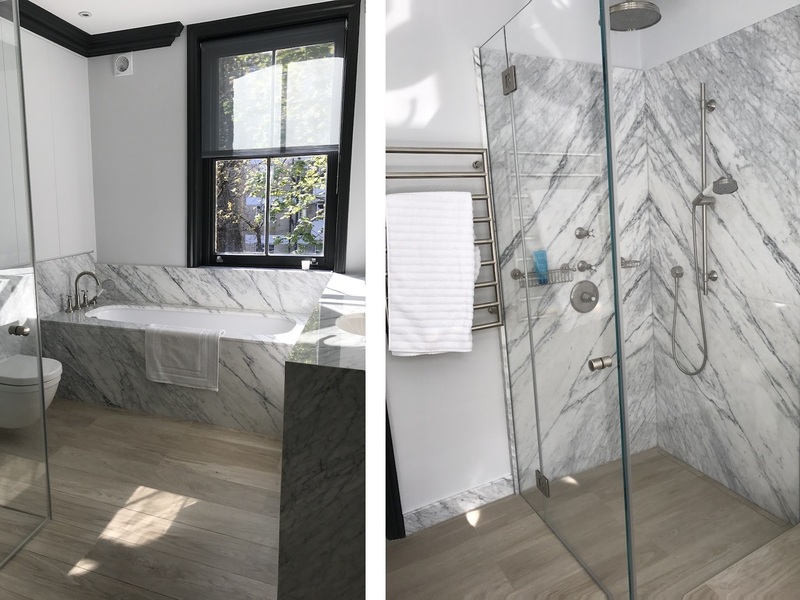 These designer bathrooms were completed to the highest standard, featuring waterproof TV's, custom vanity units with quartz surfaces, custom mirror cabinets, whirlpool bathtubs and bespoke showers. 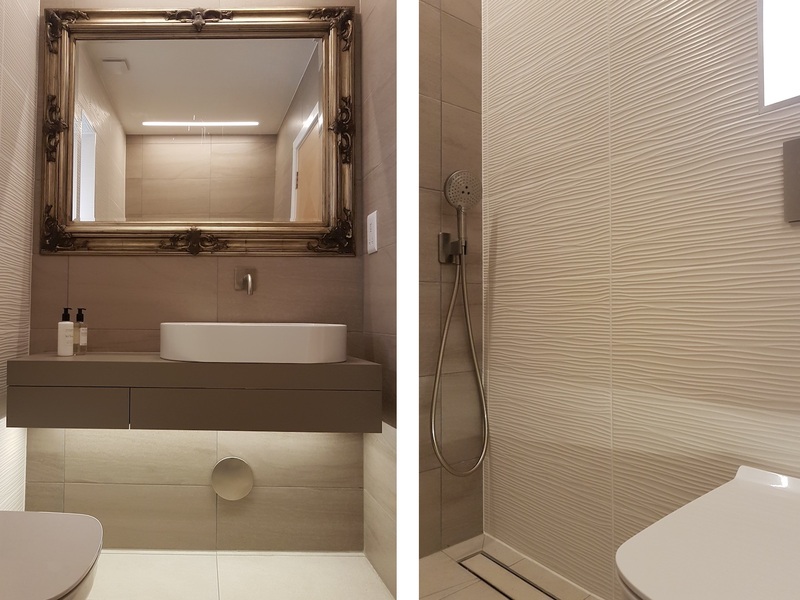 This Downstairs Guest bathroom features Duravit sanitaryware and furniture, with a custom decorative mirror with heated des-mister pad behind. 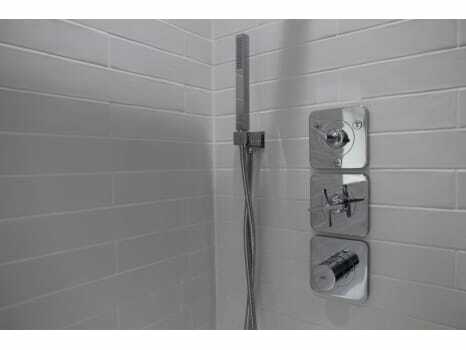 The Axor basin mixer is electronic and all fittings are finished in Brushed Stainless Steel. 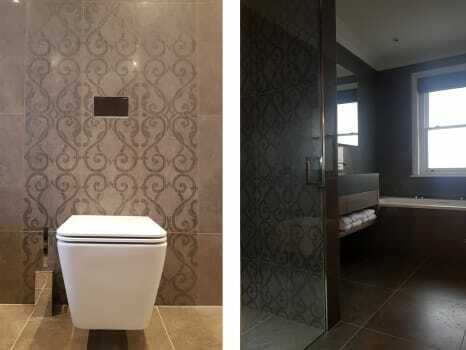 We love the wave effect tiling that greets guests as soon as they step into this bathroom! 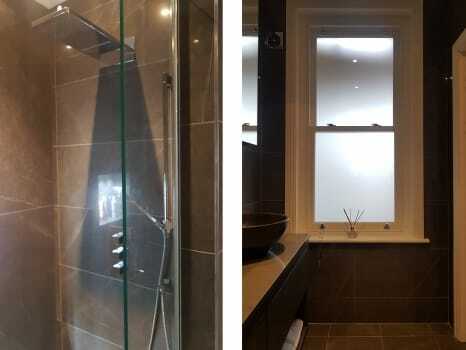 This project was supplied by bathroomOne and included the supply of 2 bathrooms, with a stunning result. 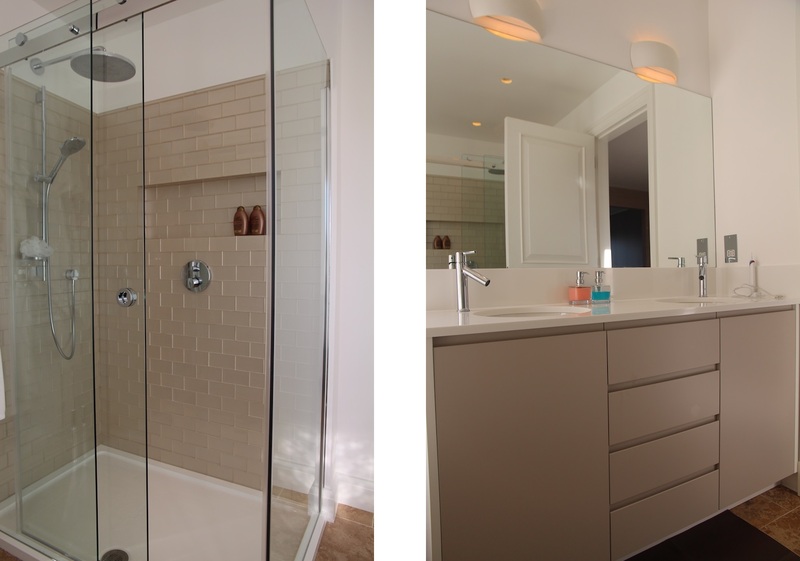 Sometimes, less is more, and this is beautifully achieved with these two bathrooms. 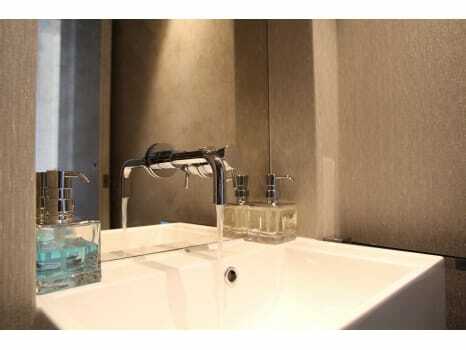 Each bathroom had Duravit sanitaryware, with a combination of Hansgrohe and Crosswater brassware. 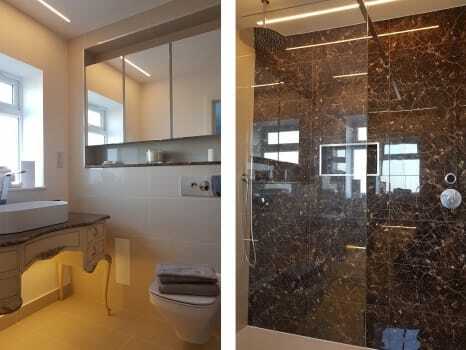 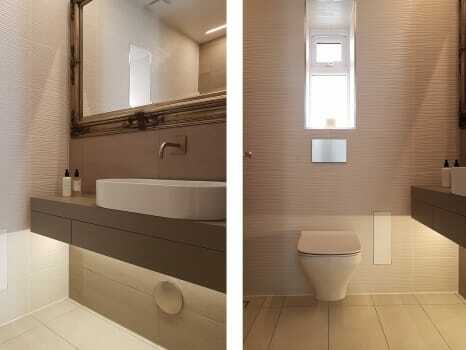 Illuminated LED Mirror Cabinets were fitted to each bathroom. A premium shower from Matki for the main bathroom stood out, along with large format 1.2m x 0.6m porcelain marble effect tiling. 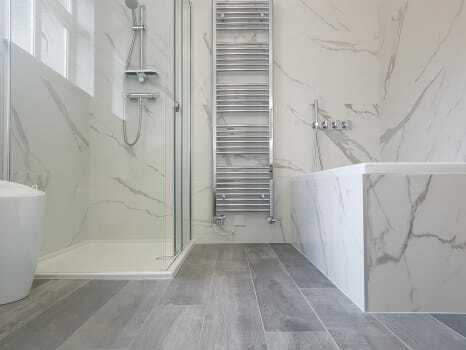 Wood effect porcelain flooring completed a visually stunning main bathroom. 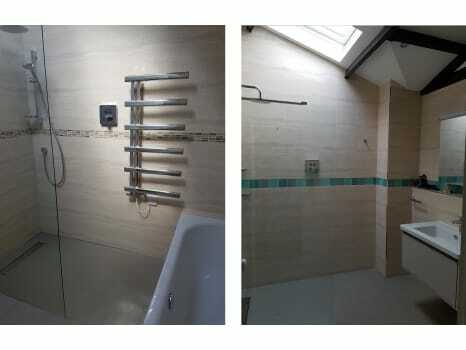 This project was supplied by bathroomOne and included the supply of 3 bathrooms. Each bathroom had a combination of Duravit and Catalano sanitaryware. 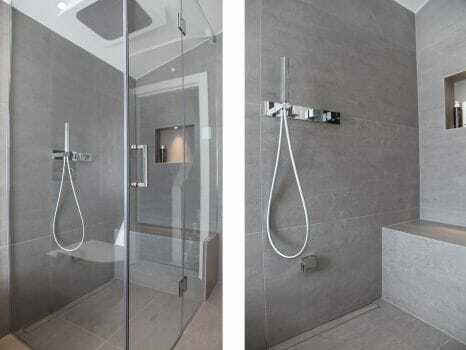 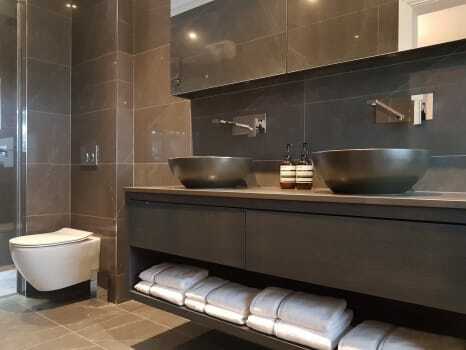 Hansgrohe brassware was used throughout, ensuring only quality fittings were used. 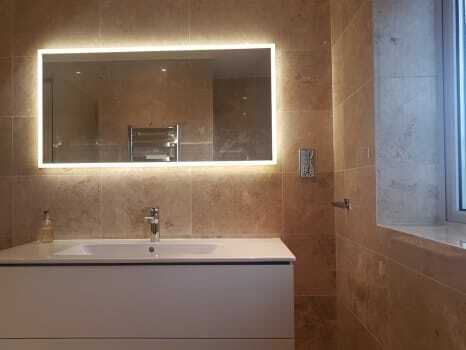 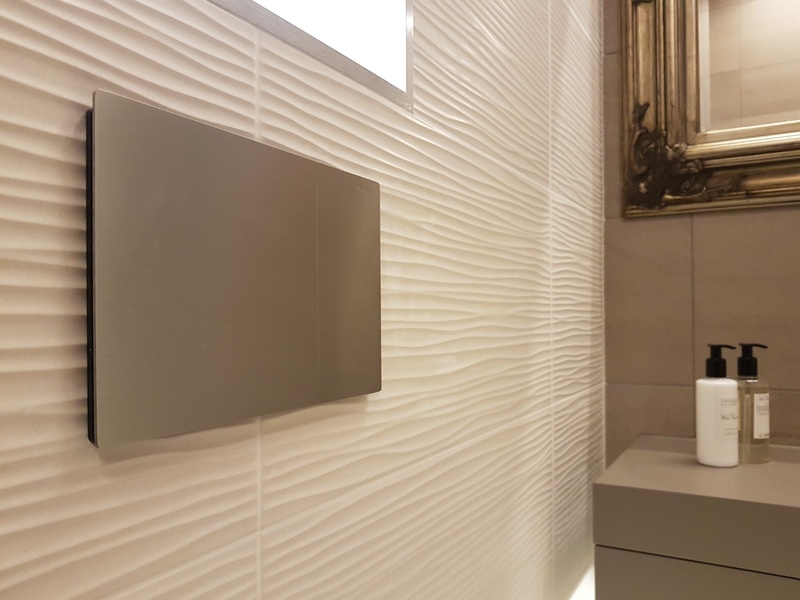 Illuminated LED Mirror Cabinets which change from warm white to cool white by hovering your hand over a sensor, were fitted to each bathroom, and added a nice modern touch. 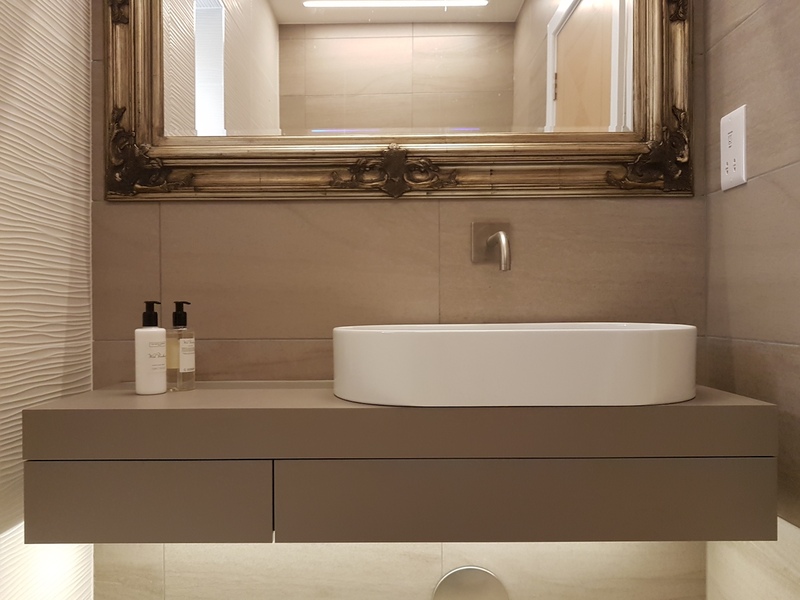 All Catalano vanity units were fitted with internal LED lights so when the drawers were opened, a light would illuminate the drawer interiors. 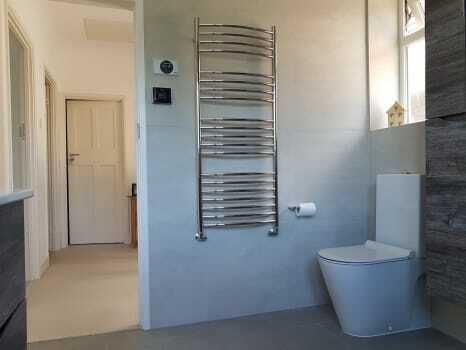 To complete, beautiful polished stainless steel towel rails by JIS were fitted. 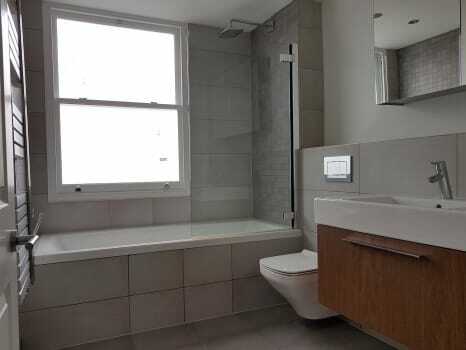 An excellent, modern set of bathrooms. 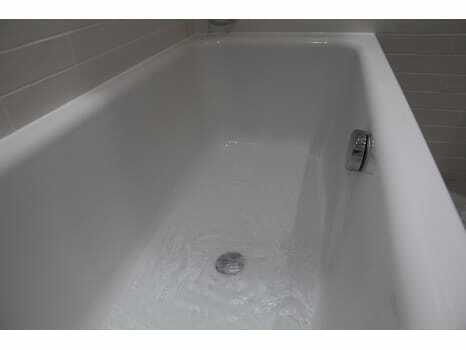 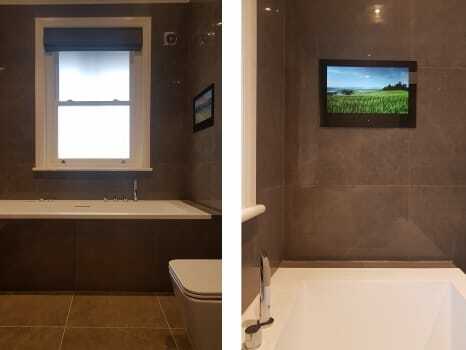 This project was supplied by bathroomOne and fitted by one of our approved installers. 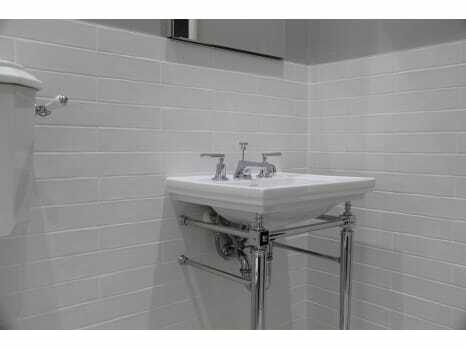 Detail was key here again, where there was no tile trim used anywhere, with tiles being mitred cut, to achieve an excellent end result. 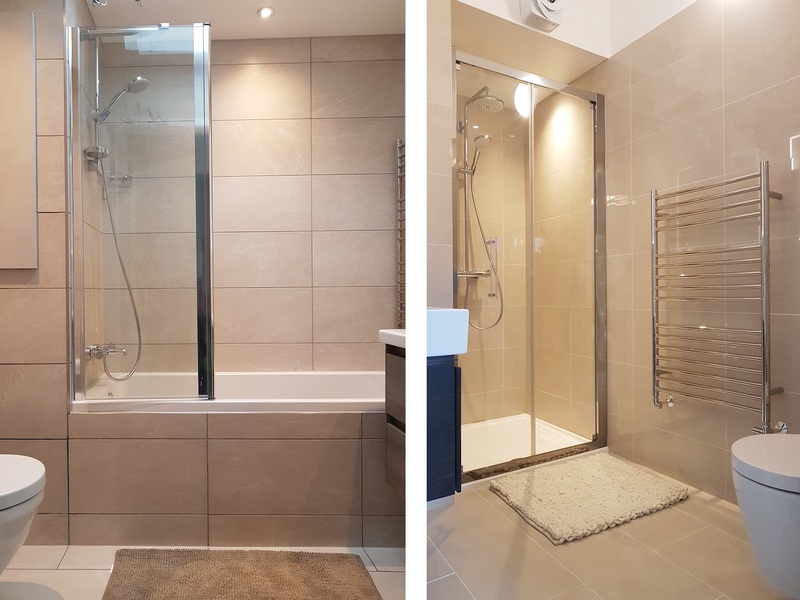 Our client opted for a large Simpsons shower enclosure with Crosswater fittings. Duravit ME By Starck sanitaryware and a beautiful LED illuminated mirror cabinet creates an overall beautiful bathroom. And to finish this bathroom off, a ceiling mounted bluetooth speaker was also installed. 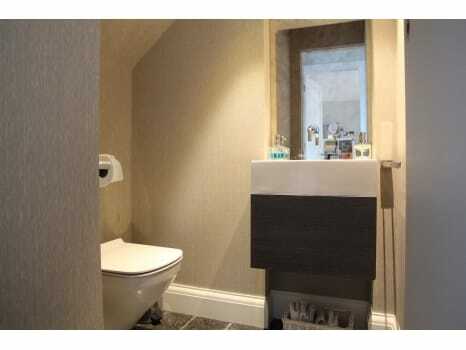 This project was supplied by bathroomOne and fitted by one of our approved installers. 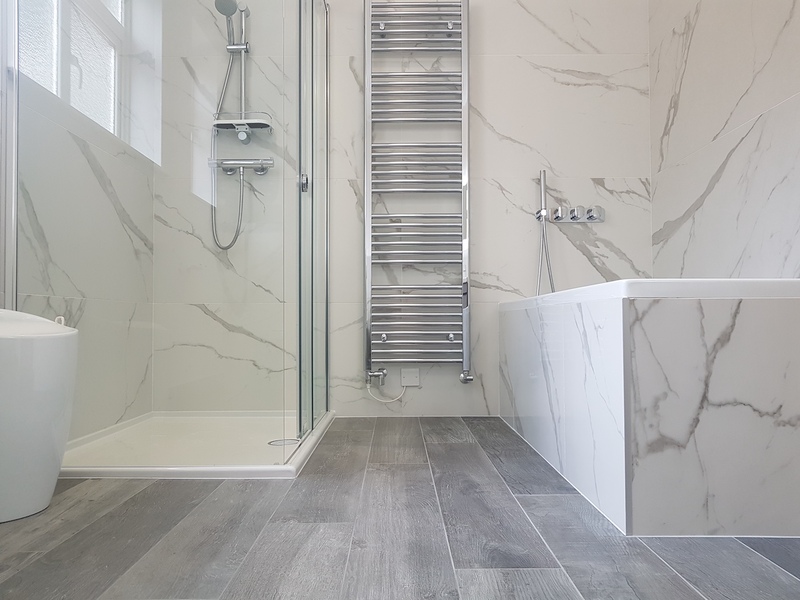 A combination of Marble tiling with wood effect floor and Brushed Nickel taps and radiators from Bard & Brazier created an astounding result. 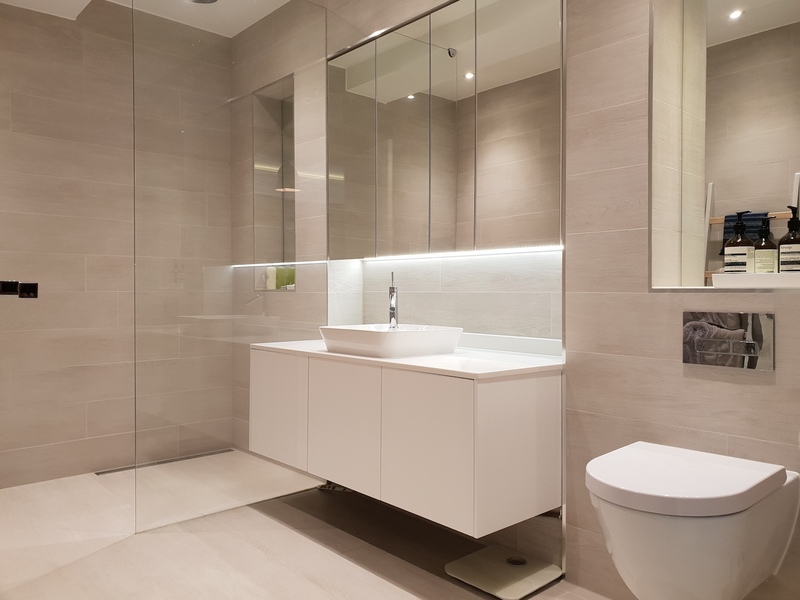 The bespoke glass had recessed channels to the floor and walls, creating an ultra minimalistic, true frameless look. 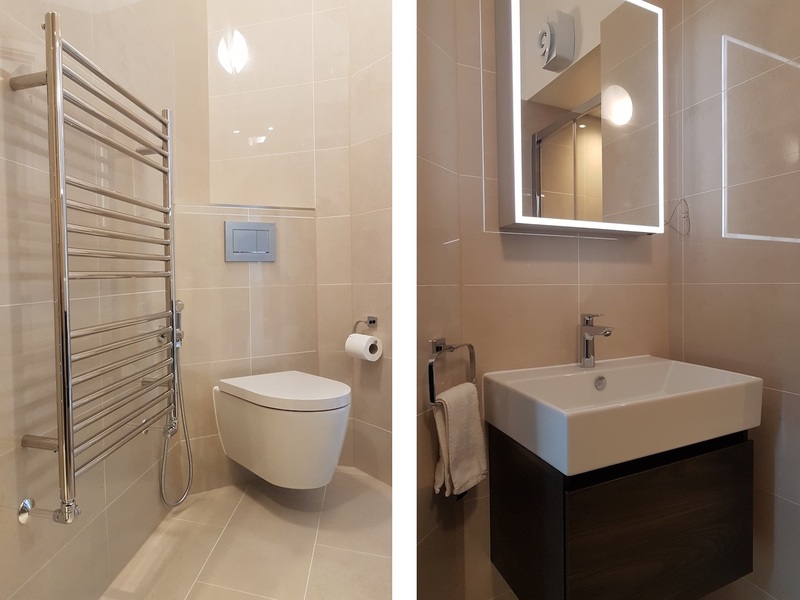 Duravit Starck sanitaryware coupled with a beautiful Bette bathtub and Axor Brushed Nickel brassware completed these very high end bathrooms. 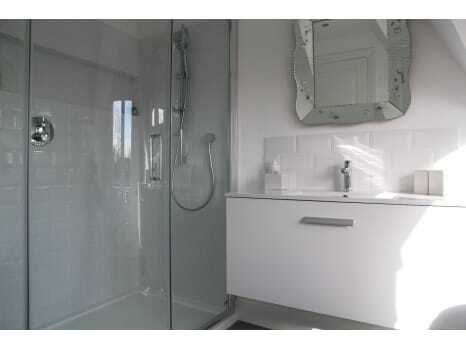 This project was supplied by bathroomOne and fitted by one of our approved installers. 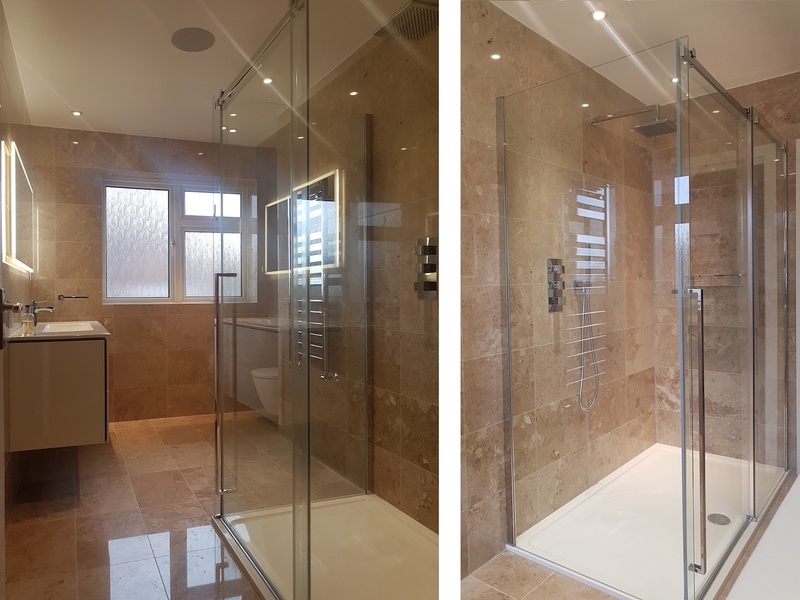 Our client opted for a luxurious steam room with bespoke floor to ceiling 10mm thick glass with recessed channels to the floor and walls, and the steam generator. 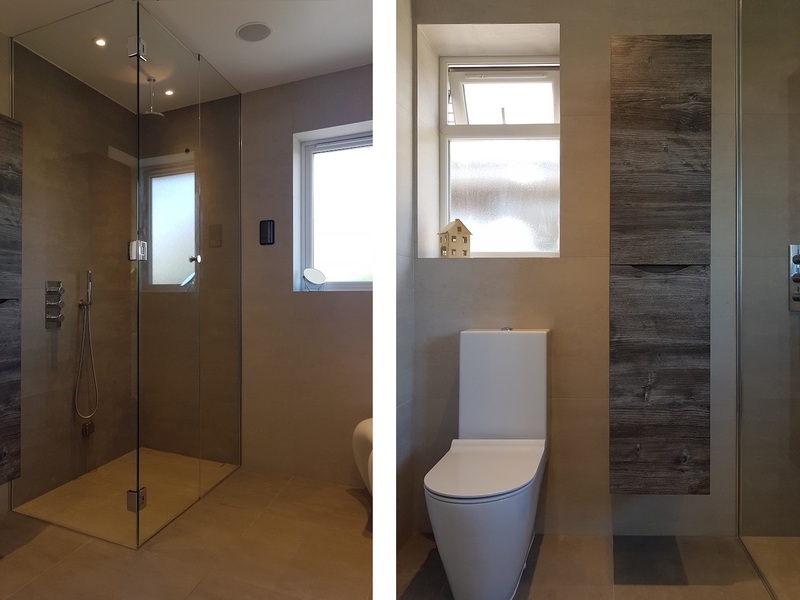 Catalano and Bauhaus sanitaryware with Driftwood finish furniture was installed in this project, accompanied with Crosswater brassware. 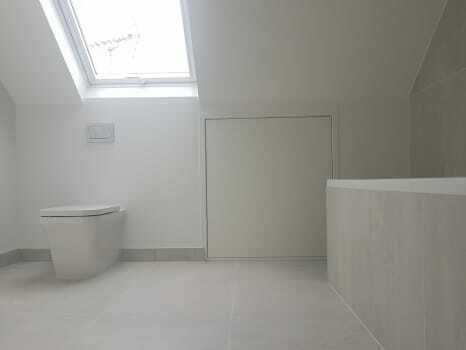 Underfloor heating throughout, and ceiling mounted speakers add to the endless amount of features behind this bathroom. 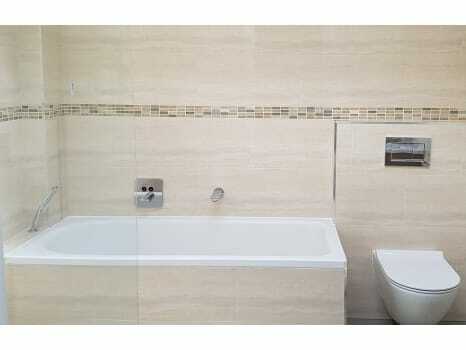 Mitred tiling to ensure there was no need for tile trim also adds to the high level of detail of this bathroom. 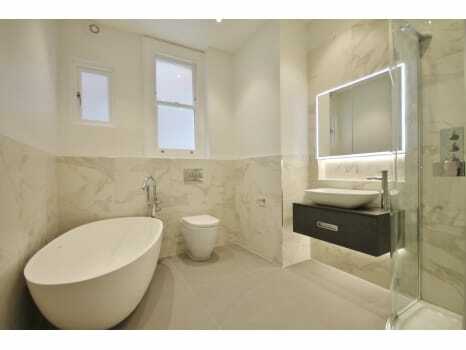 An exceptional bathroom, with exceptional features! 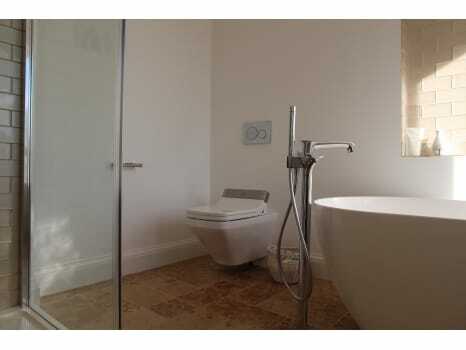 This project was supplied by bathroomOne and fitted by one of our approved installers. 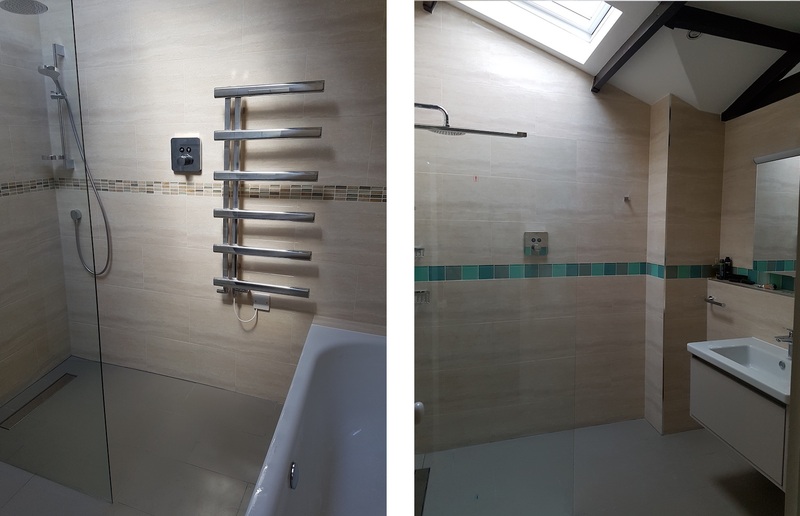 Our client opted for a Merlyn Shower Enclosure, Axor Brassware, Duravit and Bauhaus Sanitaryware. 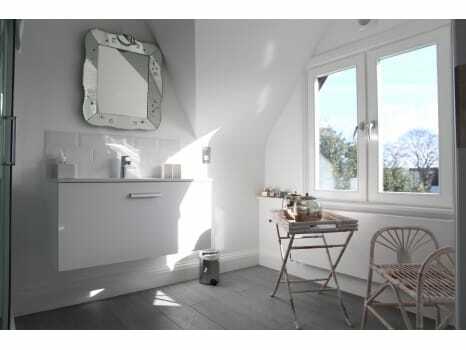 Great natural light and the light colours within this bathroom makes it airy and spacious. 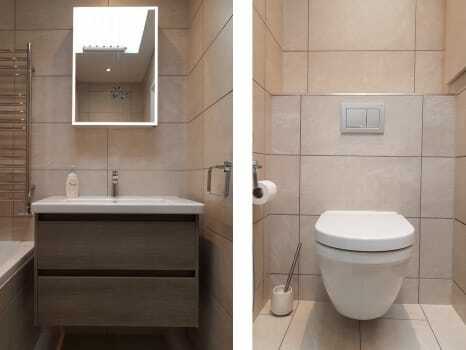 An immaculate and extremely photogenic bathroom! 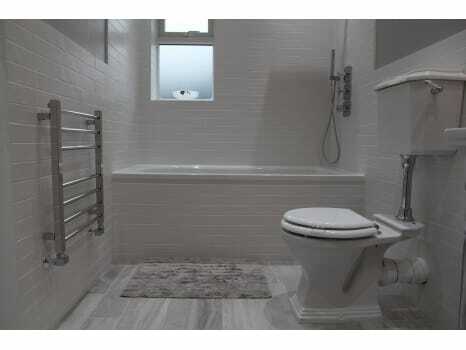 This project was supplied by bathroomOne and fitted by one of our approved installers. 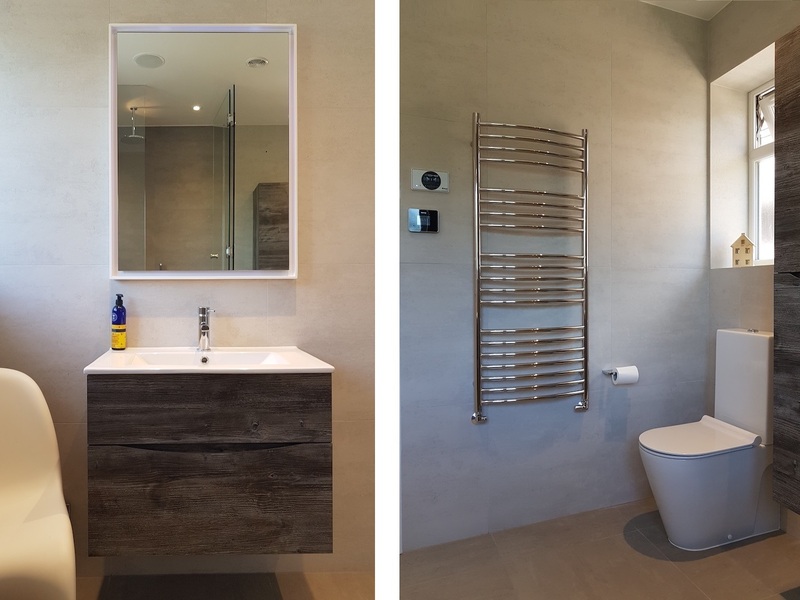 Our client opted for a beautiful Freestanding Natural Stone Bathtub, Axor Brassware, Duravit Sanitaryware with the Sensowash Seat, alongside a beautiful custom made vanity unit by our approved installer. 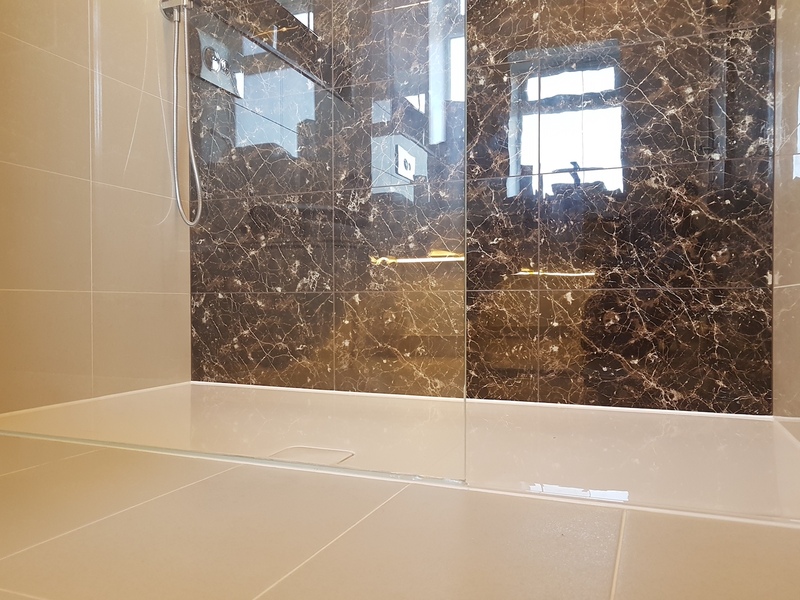 Glass mosaics used in the recesses and shower cubicle only, with the rest of the bathroom being painted, makes for one of the most beautiful bathrooms we've ever worked on! 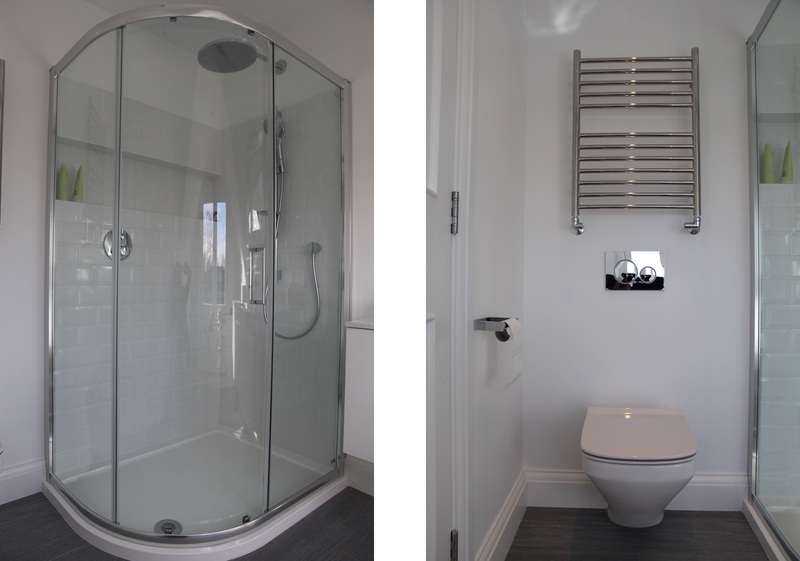 This project was designed and supplied by bathroomOne and fitted by one of our approved installers. Our client opted for a beautiful Freestanding Natural Stone Bathtub, Crosswater Brassware, No Code & Bauhaus Sanitaryware, alongside a HIB Mirror Cabinet. 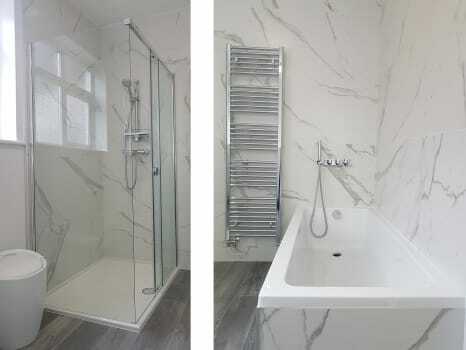 Set against a Carrara Marble tiled backdrop, the result - an absolutely stunning contemporary bathroom. 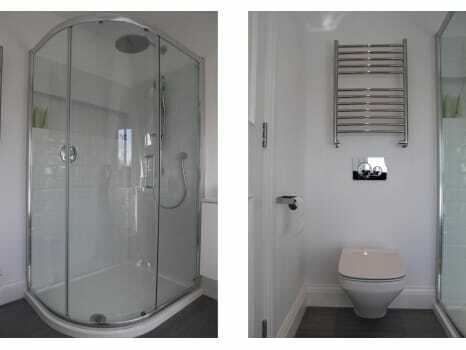 This project was designed and supplied by bathroomOne and fitted by one of our approved installers. 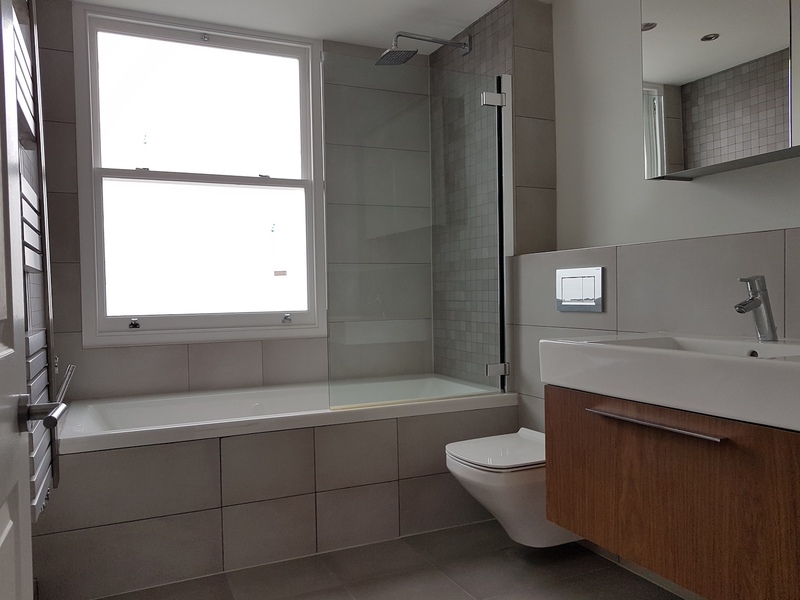 Our client opted for a Bette Ocean bathtub with Axor Controls, a Bisque Gio Towel Radiator, Imperial Astoria Deco Sanitaryware and a Lefroy Brooks Basin Mixer. 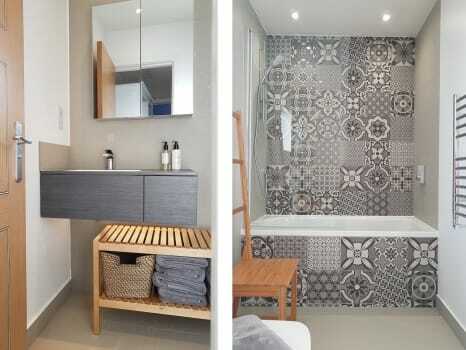 The result - a perfect marriage between Classic and Contemporary. 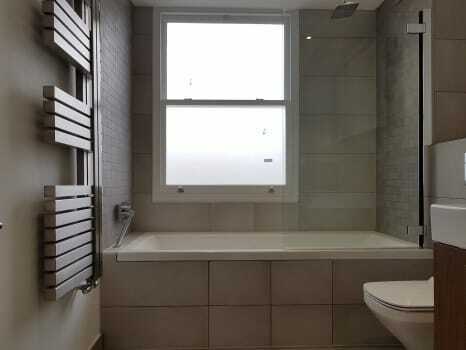 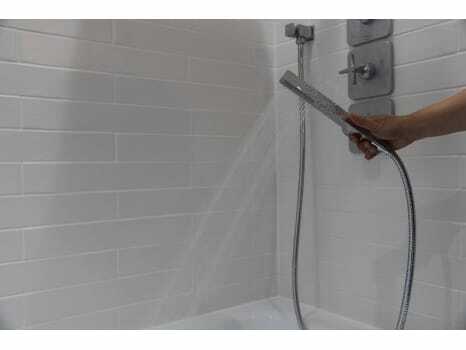 This project was supplied by bathroomOne. An under-stairs cloakroom containing a mixture of Duravit and Bauhaus sanitaryware, alongside Crosswater brassware. 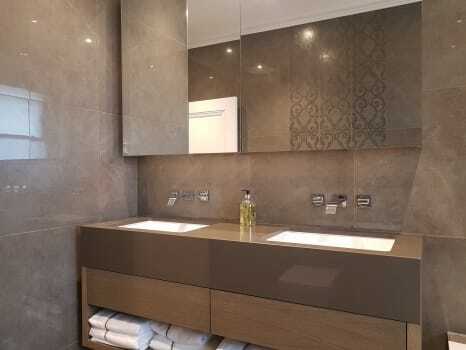 The wall mounted basin mixer coming out from the stained bronze mirror created an ultra contemporary look with the wallpapered sides really making this a design led cloakroom. 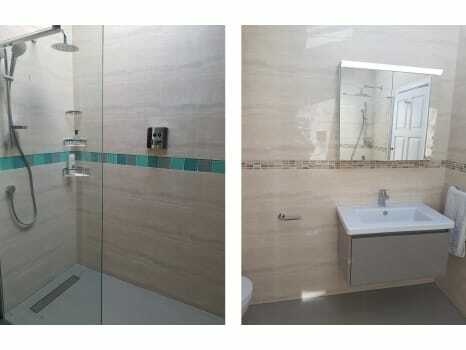 This project was supplied by bathroomOne. 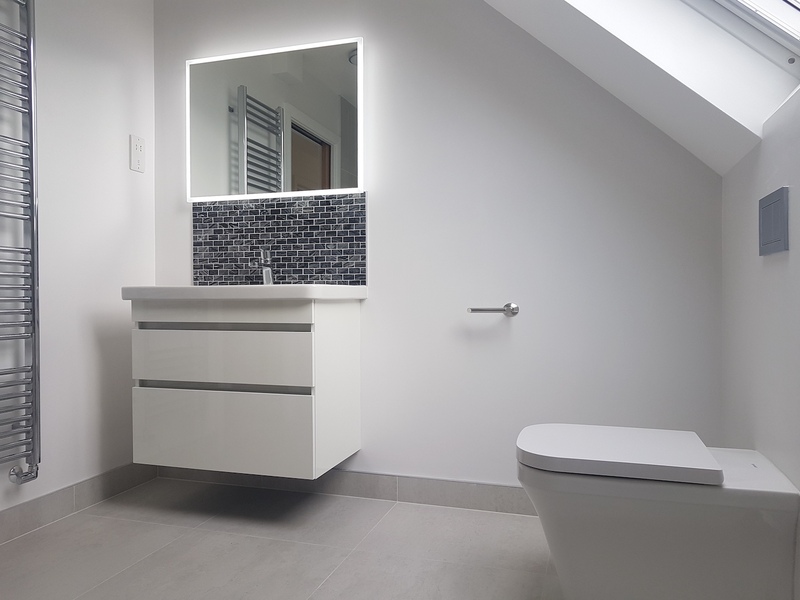 A mixture of Duravit Vero and Duravit DuraStyle sanitaryware and furniture was supplied alongside Axor Hansgrohe brassware. 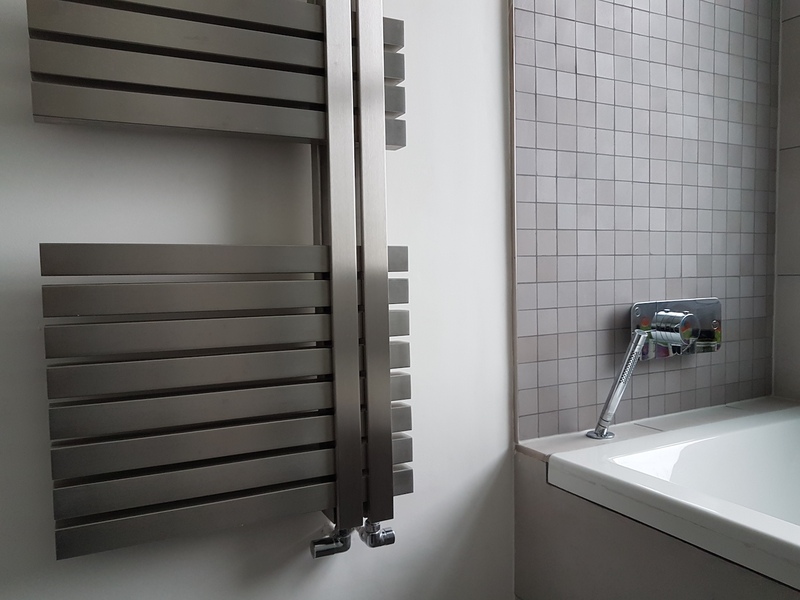 An eye-catching, brushed stainless steel radiator by AEON completed the look. 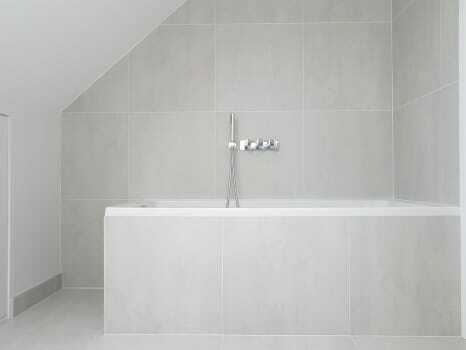 This, together with precision tiling detail, created a wonderful, contemporary bathroom. This project was supplied by bathroomOne. 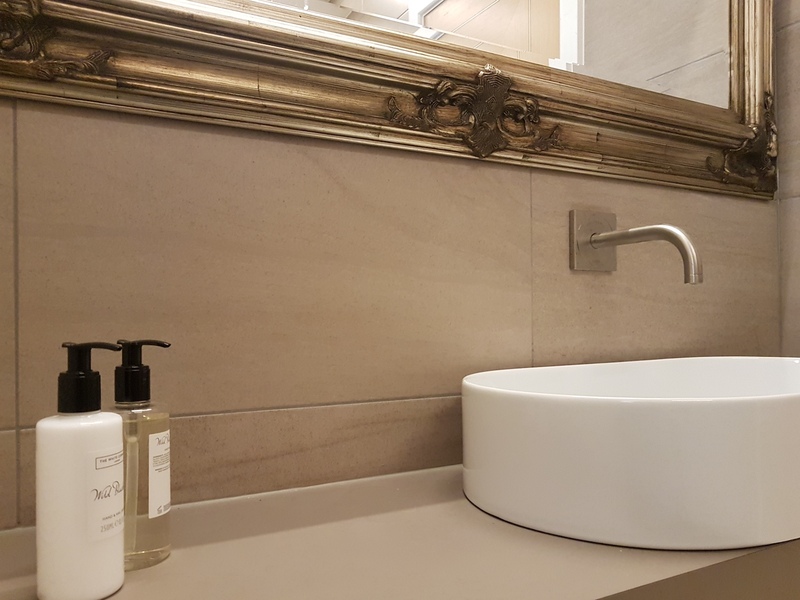 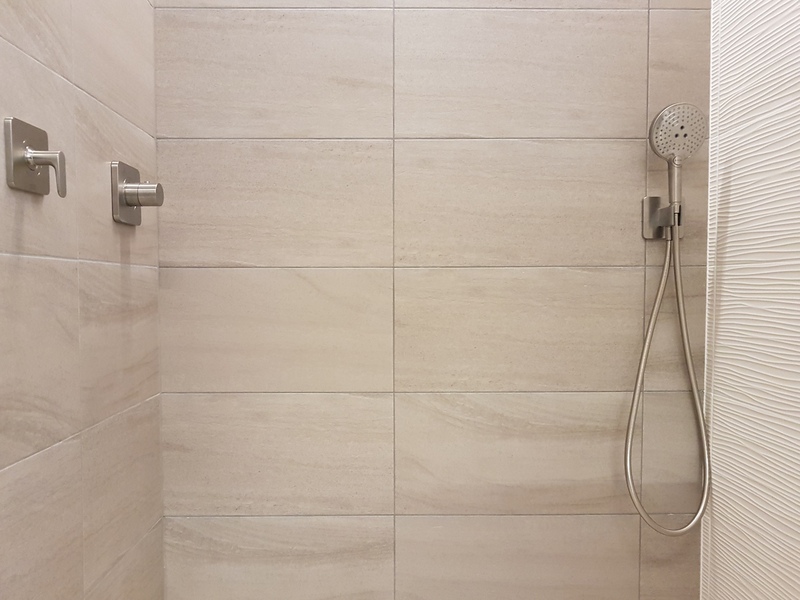 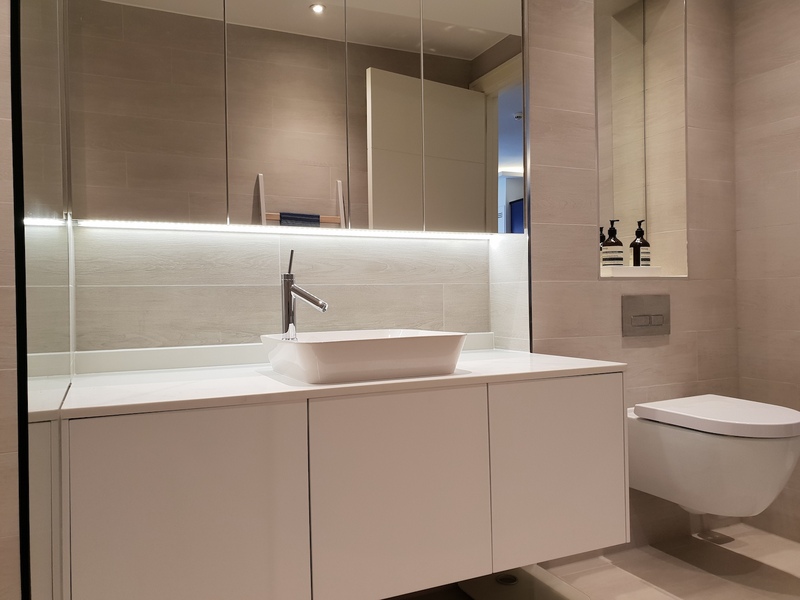 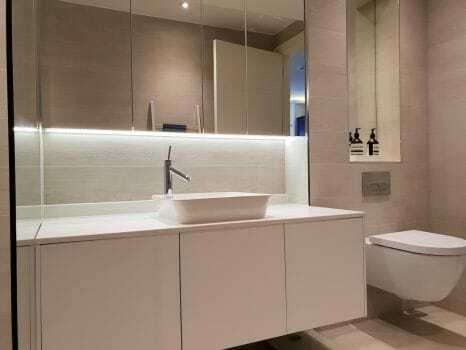 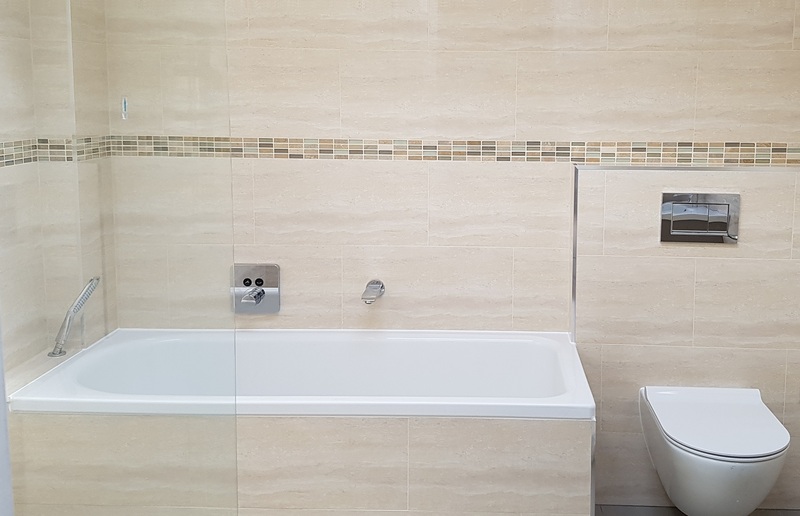 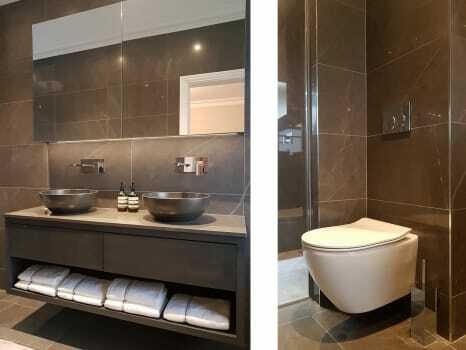 A number of bathrooms were specified for this project in Hampton, where the client opted for Catalano sanitaryware and furniture accompanied with Hansgrohe Axor brassware. 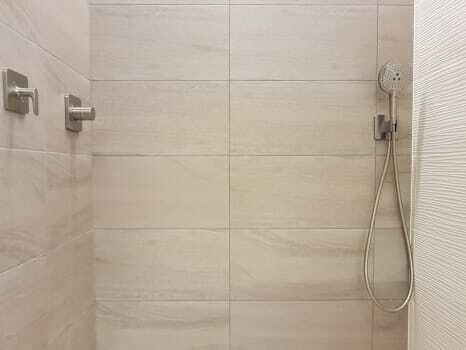 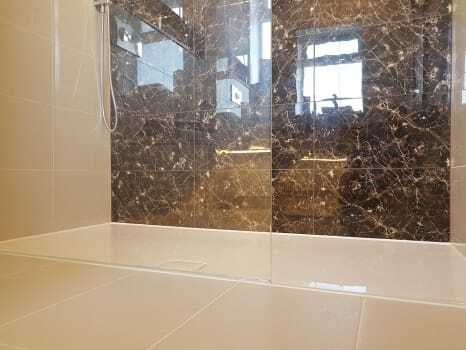 The clients also opted for a walk in shower with a tiled floor. 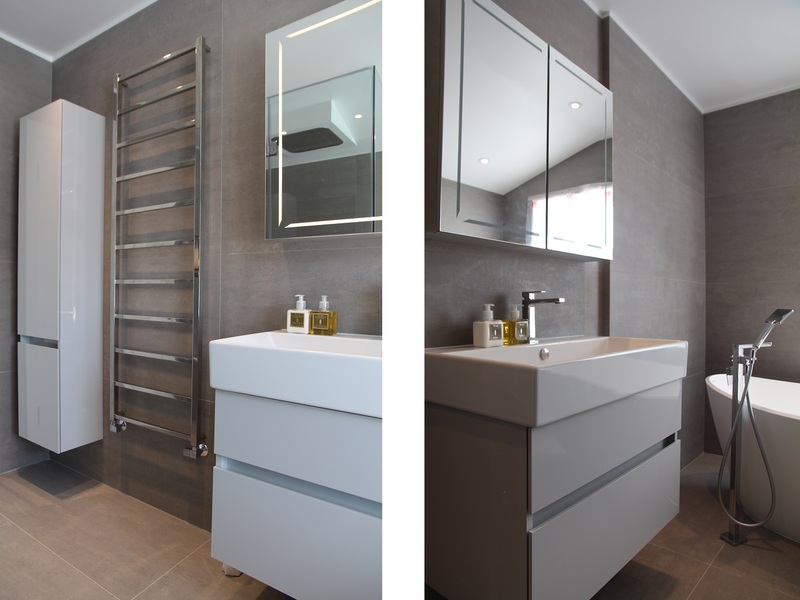 The gleaming Chime radiator by Bisque finished off these beautifully light and airy bathrooms. 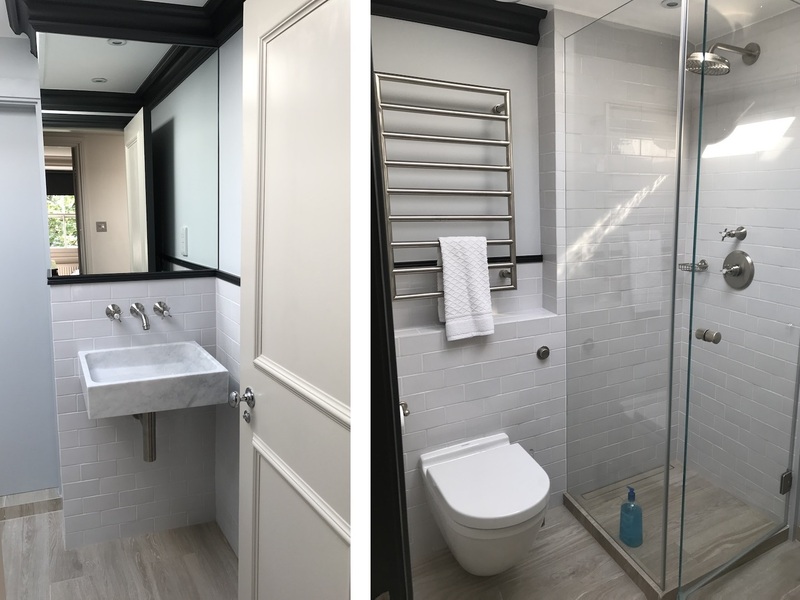 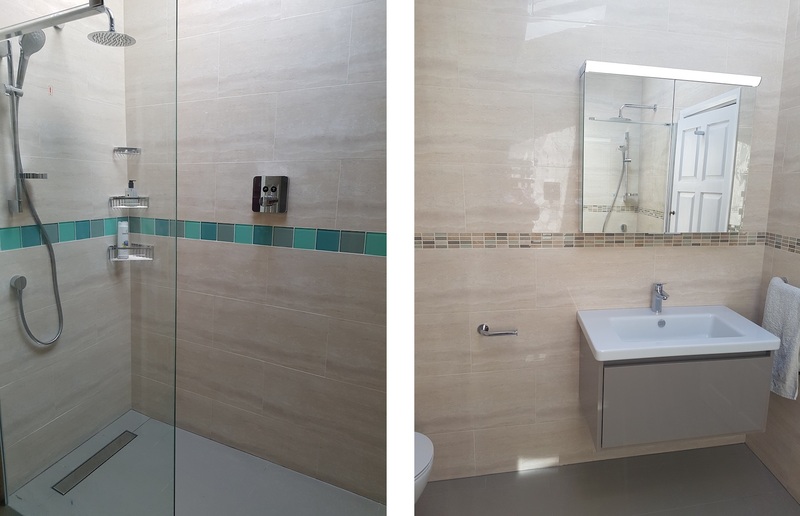 This family bathroom features Bauhaus and Duravit sanitaryware with Hansgrohe ShowerSelect Glass brassware for the shower and Dornbracht Lissé brassware for the basin. 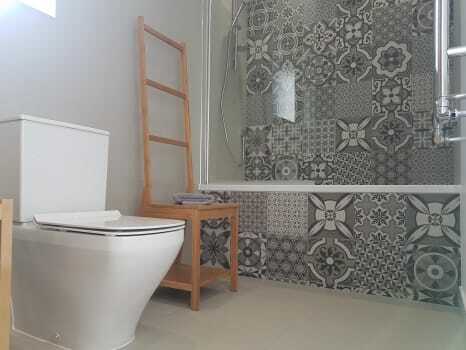 We love the feature mosaic wall over the bath. 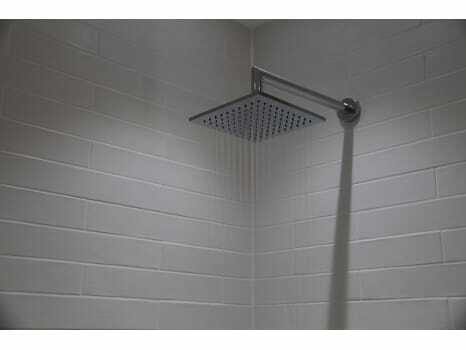 A real statement. This bathroom features Duravit and BagnoDesign sanitaryware with Dornbracht's CL.1 Spout and crystal effect hot and cold deck valves for the basin and Zucchetti Savoir controls for the shower. 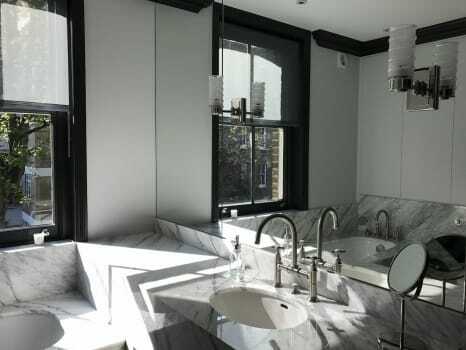 The lighting and blend of old (custom vanity unit with marble top) and new in this bathroom is absolutely beautiful.